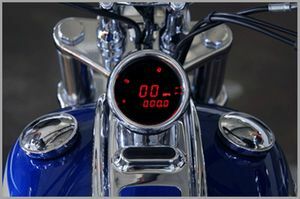 The all new MCL-3200 series gauges are direct plug-in instruments. Simply remove your old gauge and plug these gauges into the stock harness and bolt it back into the stock location. Fits stock mounting cup without modifications (does not fit Dakota Digital mounting hardware). Several performance calculations include: 0- 60 time, high speed & high RPM recall, 1/4 mile time and speed. Chrome front bezel Machined aluminum housing.